Which 4G Network Provider is Best for Your Propane Tank Monitors? When evaluating tank monitoring solutions, it’s important to understand how they connect and transmit accurate, real-time data to your software portal. Because we all know that without consistent and reliable connectivity, the data measured by the device is useless. What does all this mean? The network that connects the devices is integral! 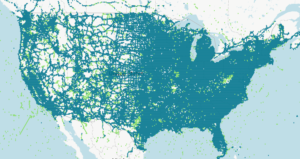 We recently wrote a blog post comparing popular tank monitoring networks from mobile to satellite to radio in terms of speed, reliability and costs. The results were overwhelmingly in favor of 4G mobile networks as the fastest, most reliable and cost efficient option for tank monitoring. However, not all 4G mobile network providers are the same; each has their pros and cons. This blog looks to outline the most popular mobile network providers and where each of them excel. We studied the top network providers to figure out which one will be able to maximize 4G LTE performance for your region and in turn, help you deliver maximum performance and savings from tank monitoring. Let’s dive in. In December of 2010, Verizon Wireless launched the first 4G LTE network in the nation. The enterprise has invested over $126 billion into cellular networks starting in 2000. Not only were they the first to release the network, but Verizon has since won several awards commemorating them for their outstanding network performance. 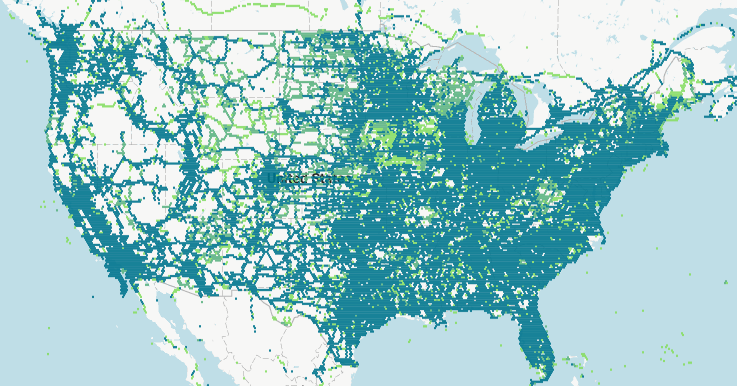 Today over 98% of the US is covered by Verizon 4G LTE. In late 2011, AT&T deployed its first 4G LTE network. They then invested over $140 billion into their wireless network from 2012-2016 as the nation’s largest investor of capital for those years. AT&T’s wireless network has a concentration in their 21 state home-internet footprint which is almost entirely in the southern region of the nation. Recently they were granted approval to merge with Time Warner, one of the biggest entertainment companies in the world, in an $85.4 billion acquisition. T-Mobile was one of the last to launch its 4G LTE network in 2013 after their plans to merge with AT&T fell through. They then invested 4 billion in one year on their LTE wireless network to catch back up to all the other providers. Following approval of the AT&T and Time-Warner merger, it is setting the stage for more acquisitions as T-Mobile now has plans to merge with Sprint. Which 4G Tank Monitoring Network Provider is Right For You? Now that we have an understanding of each operator, let’s take a closer look at three main criteria that you should evaluate to choose your tank monitoring network provider: Coverage, Speed & Reliability. To determine these, we chose to look at the two biggest studies of mobile network performance: Rootmetrics and OpenSignal. For this post, we will be using both to evaluate the best mobile network provider for propane tank monitoring. Please note that Rootmetrics and OpenSignal use different methods for evaluating network coverage, each with their pros and cons. How available is a provider’s 4G network for your regional customer base? It is important to investigate the network’s availability in your precise geographic area. Network providers tend to prioritize more densely populated areas, occasionally leaving out the rural regions. A 4G LTE network that fails to cover even your most remote customer’s tank monitors could be a recipe for disaster. Check out this interactive map to see coverage in more individual areas. RootMetrics coverage maps reveal national coverage of best technology for each provider. It is clear that Verizon Wireless holds the largest presence on the map, while AT&T comes close behind and T-Mobile follows. 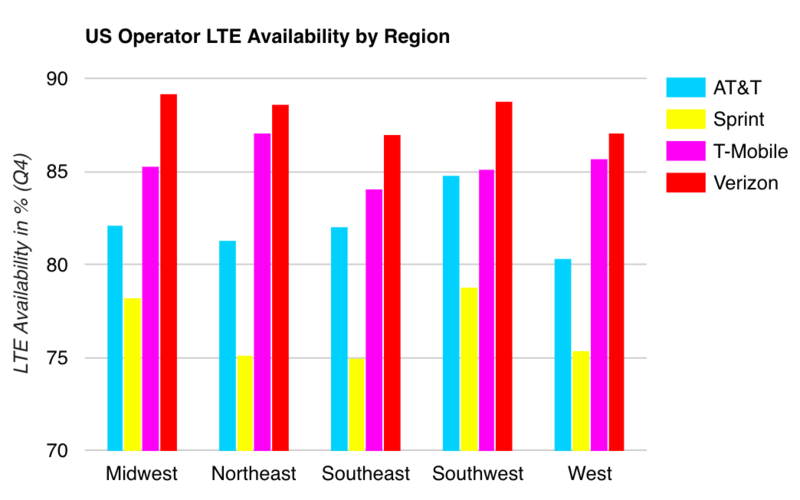 This study revealed that 88.2% of Verizon users had access to their 4G LTE network at all times, T-Mobile with 86.6% availability, and AT&T close behind with 82.23% availability. Regionally, Verizon sweeps the charts in each region for availability; the national testing proved maximum coverage overall. T-Mobile was runner up, ranking second in four regions. In the Southeast region, all network providers had their lowest regional performance besides AT&T. What’s the point of having a tank monitor if it’s slow and not providing accurate, real-time and frequent readings? The speed of your data transmission is important because it determines just how accurate your readings will be. In order to detect valid real-time tank monitor readings at your desired frequency, your provider cannot have a slow, lagging network. Again, this is geographically determined so some areas are more susceptible to slower speeds, but there are ways to maximize speed in your area by choosing a reliable network. RootMetrics reports reveal speed as the most unchanged factor for all three network providers. Verizon’s user experience was at 92.9%, AT&T at 91.4% and T-Mobile in last with only 90.5%. Even though these numbers seem close, the difference of even 1% could mean thousands of failed tank monitor data readings. This report shows Verizon Wireless and T-Mobile have very close average download speeds, but Verizon takes the cake with 16.89 Mbps, .24 mbps less than T-Mobile. This study reported AT&T a bit slower with an average download speed of 13.86 Mbps. A network can be fast and broad but if your server crashes all the time, is it worth it? The overused term of actually being a “Reliable” network provider can be misleading. A reliable network is one that ensures consistently well-performed tank monitoring readings for each of your customers. This can be measured through consumer experience. RootMetrics’ reliability scores report Verizon at 95.9% positive consumer experience, with AT&T at 94.5% and T-Mobile at a huge drop of 87.5%. T-Mobile’s drop in reliability can be accounted for by its concentration in metropolitan areas and not on the nation as a whole. 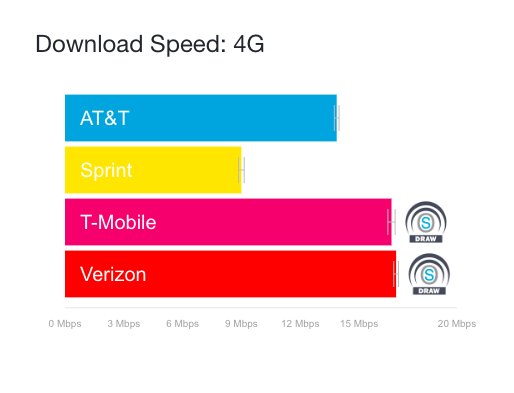 OpenSignal’s reports show T-Mobile and Verizon Wireless are neck and neck for speed, while Verizon holds onto the top spot for availability, making it the overall reliable provider. T-Mobile comes in a close second as they don’t have as much coverage or speed as Verizon. 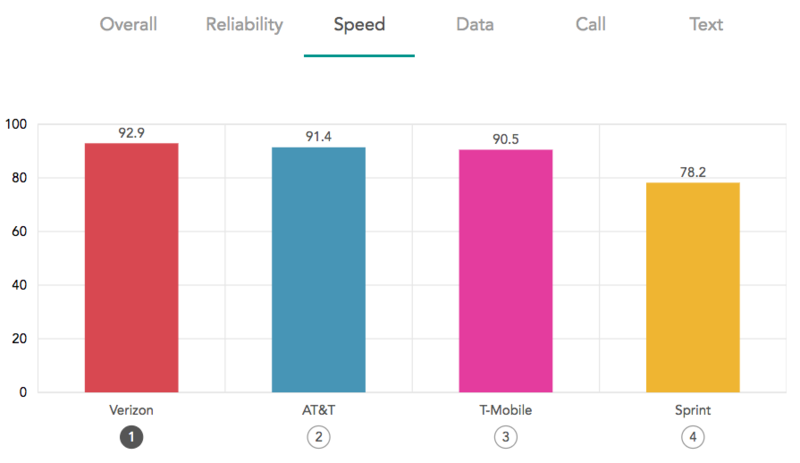 In this testing, AT&T seems to be the third tier for reliability as their results also show AT&T network performance is more latent than Verizon Wireless and T-Mobile. What is the Best 4G Network for Tank Monitoring? In nearly every metric it’s Verizon Wireless. Verizon Wireless continues to dominate with its competitors seeking to merge with larger enterprises in an arms race to outperform one another. For both Rootmetrics and OpenSignal, we have seen Verizon Wireless 4G LTE performance consistently surpass that of all other network providers. Verizon Wireless has 150,457,000 4G LTE subscribers, which is 10,000,000 more subscribers than AT&T and over 70,000,000 subscribers than T-Mobile. As the first to launch their 4G LTE network in 2010, they have invested billions into making sure it continues to lead in quality, speed and reliability. So when it comes to your tank monitoring solution, leave the management to the providers and pick a network that you can depend on, like Verizon Wireless. 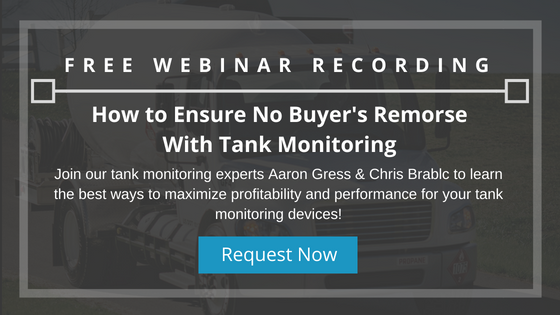 Faulty network access should not determine the performance of your tank monitors, nor your customer’s experience.